Health District sanitarians operate a comprehensive mosquito surveillance program to monitor the presence of West Nile virus (WNV) and other mosquito-borne illnesses in Hamilton County. Hamilton County Public Health works with specialists at the Ohio Department of Health on surveillance activities, including mosquito trapping and testing. WNV is a viral disease that can be carried by birds and is spread when a mosquito bites an infected bird. If a carrier mosquito bites a human or animal, they could become infected. The virus is not spread from person-to-person or animal-to-animal. Most people infected with WNV will show no symptoms at all and will never know that they are sick. WNV was first isolated in the West Nile District of Uganda in 1937. It has been commonly found in Africa, Eastern Europe, Asia and the Middle East. The first case of WNV was not discovered in the Western Hemisphere until 1999, when the virus was reported in New York City. 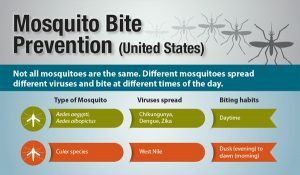 Since then, WNV has spread across the U.S.
Click here to learn more about Mosquito-borne Illness and disease. WNV is a viral disease affecting the central nervous system that can be transmitted to humans by mosquitoes. It is important to note that most people who are bitten by an infected mosquito will never become sick. However, we should all be aware of the symptoms of WNV. Symptoms may develop 3 to 14 days after someone is bitten by an infected mosquito. The more time you’re outdoors, the greater your risk of being bitten by an infected mosquito. Additionally, people over the age of 50 are more likely to develop serious symptoms of WNV if they do get sick and should take special care to avoid mosquito bites. Anyone experiencing any of these symptoms should contact their healthcare provider for evaluation. Residents should take precautions to prevent mosquito breeding sites on private and commercial properties, as well as follow safety measures to protect themselves from mosquito bites. Hamilton County Public Health suggests three simple steps you can take to help eliminate mosquito breeding sites around your home and avoid mosquito bites: Drain, Dunk, Protect. Remove any standing water from your property. Clean up litter and check tires, buckets, flower pots, wading pools and similar items that could hold water and become mosquito breeding sites. An upturned bottle cap can become a breeding site for thousands of mosquito larvae. Apply mosquito larvicide, sometimes called mosquito “dunks,” to areas of standing water that cannot be drained. The “dunks” are environmentally safe and won’t harm pets. Larvicides are chemicals or natural bacteria that can be used to kill mosquito larvae. They are the most effective form of mosquito control because they kill mosquitoes before they become adults and disperse by flying. Larvae are one of the beginning stages in a mosquito’s life cycle. Adult mosquitoes lay eggs on surfaces of standing or slow-moving water. Mosquito eggs usually hatch into larvae within 48 hours. Mosquito larvae can be found in all types of stagnant water, such as old tires, neglected swimming pools, clogged gutters, buckets, or even something as small as a bottle cap. Larvae can develop and hatch into mosquitoes in seven to 10 days, depending on the environment. are environmentally safe and can be applied by hand, by dropping it in standing water. slowly release a long-term larvicide at the water’s surface can kill mosquito larvae for 30 days or longer. are especially effective for areas where it is difficult to drain standing water, such as puddles, ditches, ponds, or tree stumps. should not be applied to drinking water reservoirs or drinking water receptacles. can be purchased at many hardware and home supply stores. Use insect repellent containing an EPA-approved ingredient such as DEET or Picaridin (KBR 3023). Follow the directions on the package. Click here for more information about recommended insect repellents and safe use tips from the Centers for Disease Control and Prevention. Most mosquito bites simply itch and leave a red bump. However, some mosquitoes can transmit disease through bites. Mosquitoes are attracted to an individual based on a complex interaction of the many chemicals you exhale, perspire or wear. Only female mosquitoes have piercing and bloodsucking organs. Hosts include humans and domestic animals and vary with the species. Has Hamilton County had any human cases of West Nile virus? Yes, the first positive human cases of WNV in Hamilton County, including the first death attributed to WNV in the county, occurred in 2002. The Health District collaborates with area hospitals and physicians to monitor for suspect cases of WNV. A reported case is considered probable until the test samples have been reviewed by the Centers for Disease Control and Prevention. Does Hamilton County have any mosquitoes or birds infected with West Nile virus? Yes, pools of mosquitoes trapped in Hamilton County have tested positive for the past several years. A pool is a group of one to 50 mosquitoes that have been collected from mosquito traps placed in specific areas by public health officials. HCPH and ODH no longer collect birds for testing, but continue to track WNV through mosquito trapping in Hamilton County. What is Hamilton County Public Health doing to prevent the spread of West Nile virus? Hamilton County Public Health District addresses mosquito-borne public health concerns. We collaborate on mosquito surveillance activities and educate the public about ways to reduce the risk of vector-borne diseases, with the goal of reducing the incidence of human cases involving vector-borne diseases. The Homeowner’s Guide to Mosquito Control brochure provides more information. How should I protect my pets? Household animals should be protected from exposure to mosquitoes. To decrease the risk, animals should not remain outside for long periods of time. If you think your pet may have contracted WNV, contact your veterinarian. An animal does not have to be euthanized if it contracts WNV; talk to your veterinarian about specific concerns. Residents who live within the jurisdiction of the Hamilton County General Health District (link to who we serve) should contact the Environmental Health Division at (513) 946-7800. Information on WNV is also available through the Ohio Department of Health at 1-866-634-2968.